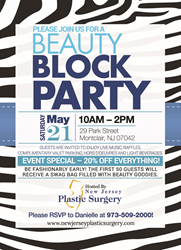 Beauty Block Party offers 20% all merchandise and a "swag bag" of beauty products for the first 50 in attendance. This month, New Jersey Plastic Surgery® invites America to an event that embraces beauty as a reason for being, whether through cosmetics, fitness, fashion or plastic surgery. Attendees are united with beauty professionals from all segments of the industry, including plastic surgeons, personal trainers, and stylists, to be well-informed and entertained. On Saturday, May 21, the company is hosting Beauty Block Party: a fun-filled event designed to educate consumers of various beauty products and services through a unique series of vendors and activities. There will be demos of the cutting edge practices, technologies, and latest beauty trends for both men and women. For those who attend, all of the merchandise and amenities at Beauty Block Party will be 20% off. Guests are encouraged to arrive early, for the first 50 people in attendance will receive a ‘swag bag’ of beauty products. In addition, live music, raffles, hors d'oeuvres and light beverages are complimentary. Vendors include Hit the Barre: Fitness & Dance Studio, Sam Samara: Professional Hairdresser, DefenAge Skin Care, JA Alternatives, 23North (Band), Glitz: Lash & Brow Studio, Rover Ranch & Spa (for pets), ENVY (clothing line) by Melissa Gorga, ZO Skin Health and many more! 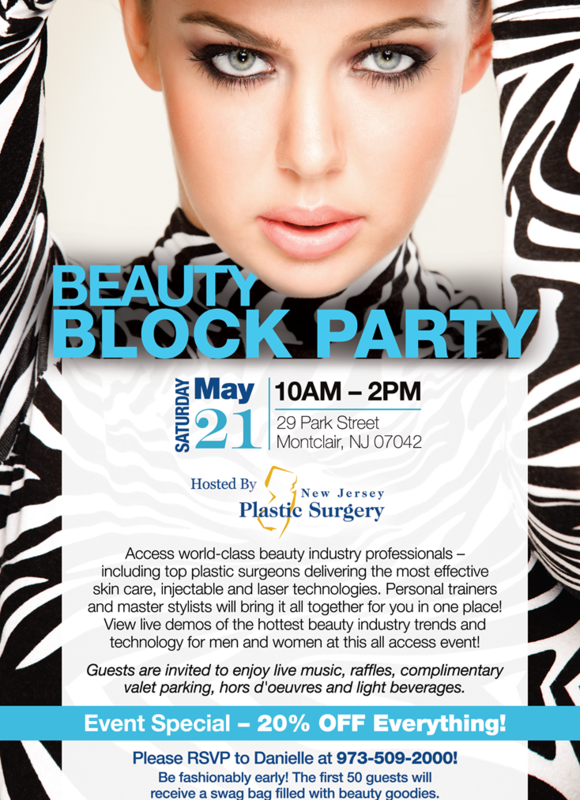 Beauty Block Party will go from 10 a.m. to 2 p.m at 29 Park Street, Montclair, NJ. Tickets are complimentary, but please contact Danielle Rost via email at drost@njpsmd.com, or call 973-509-2000 if you are interested in attending. New Jersey Plastic Surgery® is one of the premier plastic surgery centers in the US delivering the highest possible quality surgical & non-surgical procedures to patients. They are here to help customers realize their true beauty and aesthetic excellence, so they are empowered to enjoy the best version of themselves and the finest quality of life with a range of treatments, services, and products designed to rejuvenate, revive and enhance your natural beauty. New Jersey Plastic Surgery® is led by Medical Director Dr. Barry DiBernardo, who in addition to being the president of the New Jersey Society of Plastic Surgeons and being repeatedly listed as one of the best doctors in New Jersey, was recently honored by Harper’s Bazaar as one of the 24 top beauty doctors in the entire country.